Wall murals of vintage patterns like the ones you see here are perfect for tying together various elements of your decor and creating a focal point in your space. Professional interior decorators often use vintage wall art as a starting point to inspire the theme, colors, textures, fabrics and feel of the space they’re working on. 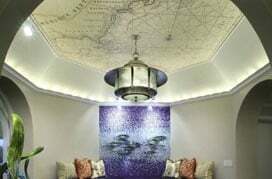 You can do the same for your space, taking your cue from this collection of unique vintage pattern wall murals. Let the designs, patterns and colors in these wallpaper murals lead you to your dream decor theme, Allow yourself to be inspired and moved by the images and colors in these classic murals. The collection features a mix of artwork and photographs with interesting juxtapositions of various elements. A guitar resting against a textured wooden wall, a swirl of colors against a rustic, parchment backdrop, brightly colored traditional Moroccan floor tiles, cobblestone paths flanking railway tracks, faded Moldavian posters that have managed to retain some of the wording and plastered paint from long ago, vintage wood blocks, old wooden doors brimming with character and floral patterns against a grunge effect backdrop are some of the extraordinary murals you will find in this collection. These vintage pattern-inspired murals vie to outdo one another in capturing your appreciation, so don’t be surprised if you can’t pick a favorite for your space instantly. Picking wall decor for your home, office or cafe is an important decision. 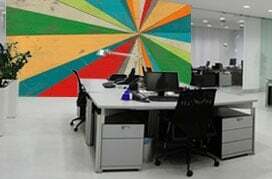 You want to choose tasteful murals that leave a lasting impact on viewers’ minds while enriching the character of your space and the quality of experience in it. So, take your time as your browse through this collection, visualize how each mural will look in your space before selecting the wall murals of vintage patterns that best suit your taste and surroundings.